This young kid from Alexandria, Egypt, who goes by the name of Disha, is an absolute genius with a football. Check it out! HE HAS SOME INCREDIBLE MOVES, and some of his groundwork looks like a weird cross between Brazilian Ju-Jitsu, football, and contact juggling. Make sure you check out his Facebook page, too. “We must never forget our history,” Leonardo DiCaprio warns in the brand new trailer for J. Edgar. Conveniently, this narrative demand means that you should probably see the very biographical drama from director Clint Eastwood that this trailer advertises. Take a look at DiCaprio as FBI director J. Edgar Hoover below in the film’s first trailer. To see the trailer in high definition, head on over to Apple. Clint Eastwood’s J. Edgar will follow the career of J. Edgar Hoover from the Palmer Raids onwards. The Warner Bros. picture also stars Armie Hammer, Naomi Watts and Judi Dench and is scheduled to arrive in U.S. theaters on November 9. When your companions are so soft and inviting it must be hard to resist snuggling up to them like this. 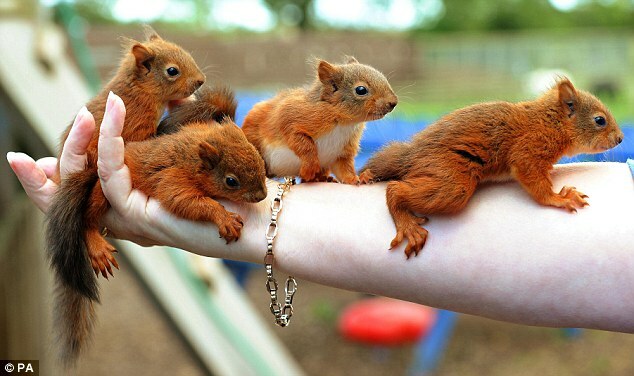 And these four baby red squirrels have a closer bond than most after surviving being just hours from death. They were blown out of their tree-top nest by high winds as Britain was struck by the tail-end of Hurricane Katia last week. 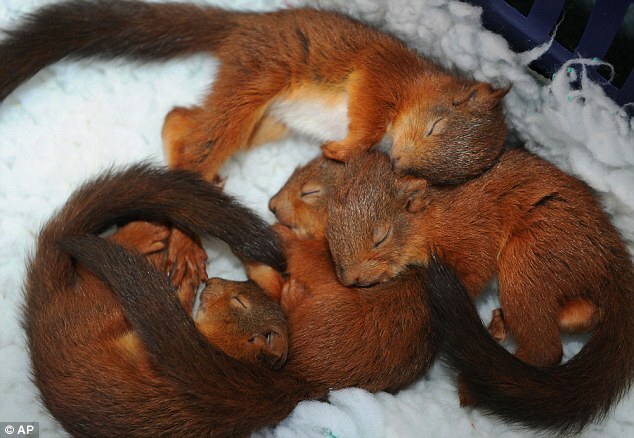 The squirrels, who are just five weeks old, were found by a passer-by in the aftermath of the gale-force winds. The rescued animals were taken to a vets' surgery in nearby Alnwick, Northumberland before being sent to the Sanctuary Wildlife Care Centre at Ulgham near Morpeth. Sanctuary owner Kim Olson said that if the animals had not been found they would have died within hours, attacked by either magpies of cats. She added that the animals, which weighed just 70grams, had gone into shock and were very sleepy and still. 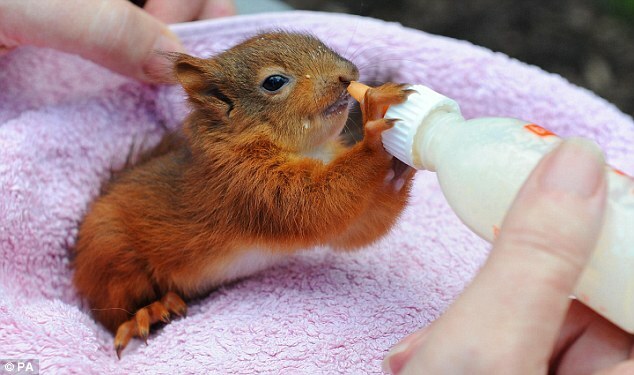 The woman who found the baby squirrels was not able to find their mother and sanctuary workers fear that she may still be looking for her offspring. Before they can be released the five-week-old animals need round the clock care and are being looked after by volunteer Eileen Welsh at her home. 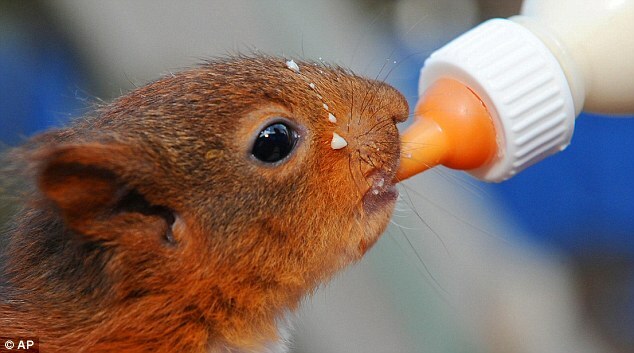 She uses a tiny bottle to feed them goat's milk every three hours and will continue to care for them over winter. Kim said: 'At this time of year the squirrels would be collecting food for winter but even if we released them in November they wouldn't have enough time. 'We're planning to release them gradually back into the wild next spring at our special unit, which is at a secret location in Northumberland. The sanctuary cares for injured and abandoned wildlife, as well as many unwanted farm animals and pets. It currently has 150 animals. The centre also organises special days for children with special educational needs or behavioural issues. It was established by Kim, 49 and her husband, Alan Petterson, in 1993 but struggling to find the £70,000 a year running costs Kim fears that the sanctuary's days are numbered. She said: 'We're probably the largest animal sanctuary in the whole of the North East. 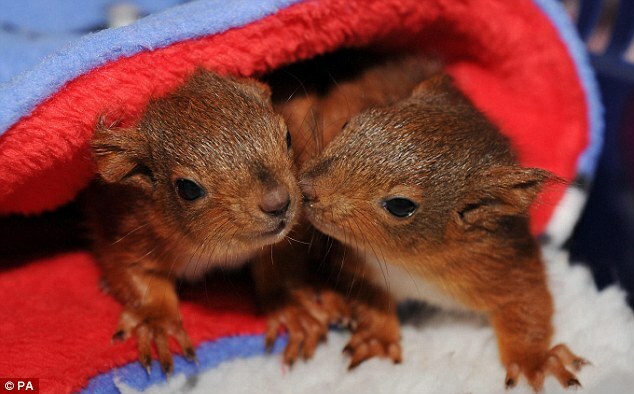 'We look after so much wildlife; we've got a badger cub, young foxes and injured birds of prey. The first themed "land" will be built at Disney World in Orlando, Florida, with construction expected to start by 2013. The blue people are coming to Disney. Walt Disney Parks and Resorts Worldwide has sealed a deal with filmmaker James Cameron and producer Jon Landau, Fox and Cameron’s Lightstorm Entertainment to create themed attractions at Disney parks based on the 2009 movie. The first Avatar attraction will be inside the Animal Kingdom park. Disney said this was chosen because "with its emphasis on living in harmony with nature, Animal Kingdom is a natural fit for the Avatar stories, which share the same philosophy." Cameron and Landau, through Lightstorm, will be creative consultants and partner with Walt Disney Imagineering in the design and development of the Avatar attractions, which eventually will be at other Disney parks worldwide as well. The deal is exclusive to Disney, which plans to roll out other Avatar attractions over time. Some of that will depend on discussions with joint venture partners on parks outside the U.S. The parks will not only play off the huge hit movie which dominated the box office for months in 2010, but also benefit from the release to two more movies now in pre-production. Cameron has announced plans to release those movies at Christmas 2014 followed by the second at Christmas 2015. Avatar was a movie that broke new ground in terms of presentation and technology, especially in the use of 3D. It is expected that the theme park attractions will also use that technology and new innovations to engage park visitors. “Avatar created a world which audiences can discover again and again and now, through this incredible partnership with Disney, we'll be able to bring Pandora to life like never before. With two new Avatar films currently in development, we'll have even more locations, characters and stories to explore,” said James Cameron. “I'm chomping at the bit to start work with Disney's legendary Imagineers to bring our Avatar universe to life. Our goal is to go beyond current boundaries of technical innovation and experiential storytelling, and give park goers the chance to see, hear, and touch the world of Avatar with an unprecedented sense of reality." "This exciting new venture combines the world of Avatar with the enormous reach of Disney and the incomparable talent of Jim Cameron,” said Fox Filmed Entertainment chairmen Jim Gianopulos and Tom Rothman. “While Jim is bringing audiences further into Pandora with the next two chapters in the Avatar motion picture saga, the theme park attraction will likewise bring a new dimension to the amazing universe he created." It was a battle of man versus beast Friday evening on Florida's picturesque St. Lucie River. The contenders: Tim Stroh, a 6-foot-3, 160-pound 19-year-old against a three-legged alligator, more than 12 feet in length and 800 pounds in weight. Armed with what his dad described as a "puny" fishing rod, the teen triumphed. Gator-hunting runs in Tim Stroh's blood. His parents, Steve and Rachel Stroh, own a taxidermy shop in their hometown of Hobe Sound, Fla. Steve Stroh told Florida's TCPalm.com that he's hosted guided gator hunts since 1989. So naturally, the family was excited when they heard rumors of a large alligator in the locks of the St. Lucie River, reported TCPalm.com. The three of them, plus a friend, loaded up a gator-hunting boat Friday, not knowing what they would find — if anything. Then, within an hour of being out on the boat, TCPalm.com reported, they spotted it. "I thought it was just a 9-footer," Tim Stroh told TCPalm.com. "Then I saw how big it was." Others on the boat tried reeling in the alligator first, but couldn't. Then Tim, using a "puny bass rod," tossed his line, Steve said. The 12-foot, 3-inch reptile chomped down, according to WPTV. It wasn't until he was reeling in the alligator that Tim realized its true size — its tail alone was as thick as his waist, according to TCPalm.com. To guarantee his victory, Tim hit the alligator with a "bang stick," a .44-caliber gun shell on a stick. "I had adrenaline pumping through me and I was just like, 'Oh my God,'" Stroh said, reported WESH.com. The alligator "came up and he was popping his jaw and stuff." Once on land, four more friends joined to help carry the alligator, which was missing one of its back legs, into the family's truck. "We have a big box cooler we normally would put a gator into, but he wouldn't fit. We had to keep him in the truck overnight and throw in ice to keep him cool," Tim said. Up until Friday, the biggest catch the Strohs had ever had was a 400-pound gator, reported WPTV. The family has special plans for this one. "I'm gonna mount the head for him so he can put it in his room," Steve told WPTV. As for the rest of the creature? According to TCPalm.com, Rachel Stroh will be making a lamp from the gator's back leg; the family has plans to make keychains from the gator's bony back; and there are 250 pounds of gator meat in their freezers waiting to be fried or made into gator sausage. Florida Fish and Wildlife Conservation Commission officials say they have had bigger catches. The longest gator ever caught in the state was more than 14 feet long; the heaviest was over 1,000 pounds, according to NBCMiami.com. Alligator hunting season runs until Nov. 1. The Strohs have permits to legally hunt. Tim Stroh, who did not return messages from msnbc.com, said the gator put up a good fight. "He had a lot of character, and I had a lot of fun," he told TCPalm.com. Season 4 of Fringe starts up in just a few days, and we have questions galore. With one of the biggest WTF endings in recent memory last season it stands to reason that the premiere would be packed with answers. Well, you’ll get no spoilers here (I would never do that to my fellow Fringe fans) but the truth is that there’s more to do than have everyone sit around asking where Peter went. After all, none of the characters even know that a Peter Bishop existed. I can’t wait to share thoughts and theories with everyone after season 4 premieres this Friday, but for now I wanted to share my top 5 favorite things about Fringe’s first episode back. Don’t worry about spoilers, I have no plot spoilers in this story, but if you want to know absolutely nothing about the episode you should turn back now. It’s fantastic how in a modern sci-fi show such an old method of exposition is utilized. And not in a throwaway, we have no better idea, kind of way. The Observers are integral to the plot; we’ve figured that out. The season 4 premiere has them acting as the audience’s anchor to Peter Bishop, and it’s a genius way to solve the problem of an absent Peter. Fringe is also aware that they need to be getting new viewers, and the Observer Chorus in the premiere is used to explain how the universe now works with the original timeline erased from existence. Sure we all love quirky Walter, with his love of candy. But there’s a genuine depth of emotion when it comes to the connection between Walter and his son Peter. Without Peter the genius scientist who is the brains behind Fringe division isn’t the same. The interesting thing is that it has nothing to do with controlling or calming Walter, a task that Astrid and Olivia prove to be quite capable of handling. A world without Peter is incomplete for Walter. New Fringe division team member Lincoln Lee steps in without a problem. With his geek chic Cillian Murphy inspired look and demeanor, the man is perfect for this show. He’s so good that even if we lost Peter forever, I think the series would survive. Lee is a geek through and through, he just happens to be an FBI geek. It’s a fantastic idea to bring him further into the fold, and the character is a wonderful bridge between the crazy fringe science and investigation aspects of the show. The audience experiences Peter’s absence, but the other characters really don’t. Fringe is doing something wonderful by not having the erasure of Peter mean that the whole universe is changed. Everyone is still working at the job they had, and you have to truly watch to see the changes. It’s so subtle that the Observer Chorus mentioned above is required for anyone new to the show. No one is learning a lesson about what they mean to the world. Probably the most divisive thing about the premiere is that it’s a tried and true monster of the week episode. I’ll go no further than that, but it was a surprising choice that took guts by the creators. Especially considering how rabid we sci-fi fans can be. Season 4 of Fringe premieres Friday, September 23rd at 9 PM ET. Back in early 2009, a solar-power skin for the iPhone was huge news. Now, it's not quite as unusual but it's still pretty exciting for iPhone owners. This time, the company is Mobius, and they're offering a pretty sweet looking case that will power up your battery with the sun. It's hard to think about being eco-friendly with your gadgets. After all, just owning one isn't very "green". Just think of all of the materials that went into constructing your favorite device, and how much energy was used to craft it. Then you go out and by cases and accessories, which will no doubt end up in a landfill someday. The very least you can do is try to occasionally recharge it with something other than a wall outlet. Um. Can I just say "ditto" and be done? Well, I guess you'll want to know a little bit about it before we wrap up. The Eton Mobius NSP300B Rechargeable Battery Case with Solar Panel for iPhone 4 is priced at $78 on Amazon. That is certainly not cheap for an iPhone case, especially considering you can make your own solar charger for iPhones in about 30 minutes for about $30. However, the price is part of the sleek package. It's handy that this fits over your phone, rather than being crammed in an Altoids tin. The skin is a rechargeable battery inside a case, wrapped in a solar cell so you can set your case out in the sun, get a charge, and wrap it around your phone for both added protection and back-up battery power. You can also charge up with solar power while it is on the phone, with the charge going straight to the phone's battery, but that means your phone is sitting out in sunshine and we don't really recommend that for the longevity of your phone. It even has a "Proprietary snap fit design that prevents your iPhone's back-glass from being scratched." A full battery will provide up to 10 additional hours of talk time, Internet use, or video playback and up to 40 additional hours of MP3 playback. However, it will likely take a couple day's worth of sunlight to fully charge the battery. For every hour of direct sunlight, you get about 25 minutes of talk time. The battery can also be recharged via wall outlet if you want to be sure you have a full back-up battery. All in all, it looks like a sleek and smart back-up plan if you're going to be off-grid for awhile. And though I already have an iPhone case and avoid getting too excited over solar gadgets, I have to say I think this might just go on my wish list for when I'm on road trips if I don't get around to making that Altoids tin charger. If you're looking for a fancy and functional skin for your iPhone, this one seems like a pretty good deal. We've already seen how one farmer trains her chickens to eat slugs, and the internet is full of examples of chicken tractors—portable coops that can be moved to allow hens to till, fertilize, and weed a plot while providing pest control in the process. (see also this overview of chicken tractors at Planet Green.) But one Australian permaculturist has taken this idea to the next level—designing an intricate system of "chook tunnels" that let him funnel his ladies into any part of his garden. The amount of work that these creatures can do is actually quite amazing. Of course many vegans will object to the idea of animals being used as "slave labor", but a system like this does go a large way toward answering the accusations of inefficiency so often leveled against animal husbandry. As soon as we stop thinking about chickens, or any other domesticated creature for that matter, as meat or egg production "machines", but rather as a productive, integrated member of a broader ecosystem, the efficiency equation starts to look a little different. From processing weeds and food scraps into eggs and fertilizer, to replacing the need for human and/or mechanized labor in tilling, this really is yet another example of farming with animals the right way. After releasing more details on the 2012 Prius Plug-in, Toyota is now announcing that the Prius V (which I dubbed the 'Mama Prius') will go on sale in the United States at the end of October. The Prius V is built on the same drivetrain - and most of the same exterior - as the regular third generation Prius, but it offers 58% more cargo space, "resulting in more cargo space than 80% of all small SUVs", according to Toyota Division Group Vice President and General Manager Bob Carter. The Prius V has 34.3 cubic feet of cargo space behind the rear seats. The Prius v will deliver estimated EPA fuel economy ratings of 44 mpg city, 40 mpg highway and 42 mpg combined (5.35, 5.88 and 5.6 L/100km, respectively). This is significantly better than other vehicles that provide the same amount of interior space, though it is worse than the regular Prius which gets 50 MPG combined. A plug-in version should come out at some point in the next couple of years, since Toyota has said that all Prius family members would be plug-in by 2014. According to Toyota, the Prius V will offer three configurations: "the value-driven Prius v Two, the mid-range Three, and the premium-level Five. The base MSRP for the Prius v are $26,400 for the Prius v Two model; $27,165 for the Prius v Three; and $29,990 for the Prius v Five. The Prius v will arrive at Toyota dealerships in late October."